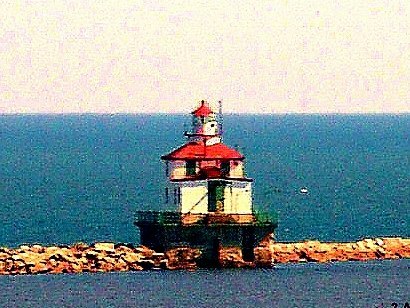 Lake Erie Lighthouses, An Erie Story. Texans hearing the word erie - can’t help but to think of a feeling of inexplicable fear or uneasiness but that word spelled correctly is eerie. The word means none of that when referring to Lake Erie. It comes from the Indian tribe who lived along its southern shore. Some say Lake Erie is the shallowest and stormiest of the Great Lakes. Others say it contains so many sunken ships it should be called the “Graveyard of the Inland Seas”. The greatest depth is probably 210 feet. On a mission of photographing lake lighthouses, from the southwest we followed the Ohio Lake Erie Coastal Trail to Fairport Harbor. 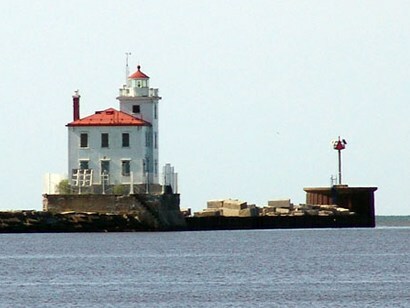 Our first lighthouse was the Grand River lighthouse near the mouth of the Grand River (itself). Built in 1825 it now houses a marine museum. 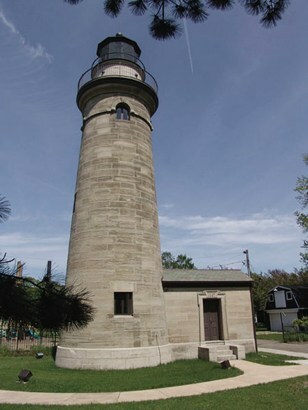 Fairport Harbor lighthouse nearby replaced it in 1871. 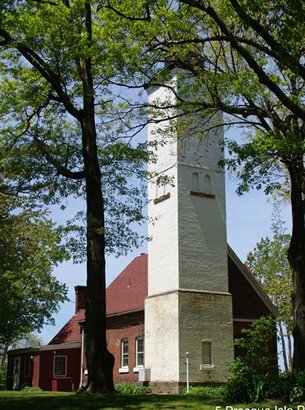 The old Grand River Lighthouse, deactivated, now a museum. Following the shore northeasterly we passed the nuclear power plant near Perry, reminding me of Commander Oliver Perry during “The War of 1812”. His ship defeated a British ship in a battle that took place in the waters off this shore. Approaching Ashtabula late in the month of May, we noticed the beauty of the Dogwood trees in full bloom. 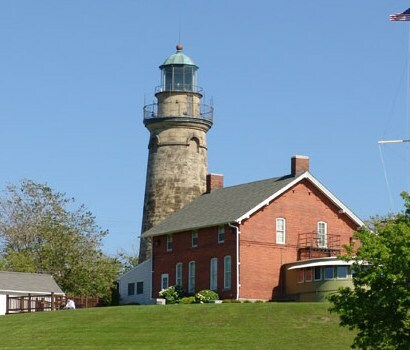 The closest viewpoint of Ashtabula lighthouse was a difficult photo because a coal powered electric plant was partly in the way. Speaking with a lady feeding birds in a park we verified that the water being sprayed on the pile of coal was to keep the dust down. She said that was only somewhat successful. 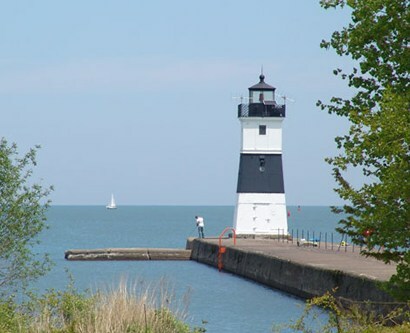 Continuing on to Pennsylvania their first lighthouse was Conneaut, an intriguing art deco design reminiscent of Port Washington, WI (Lake Michigan). In Erie, Pennsylvania we found three lighthouses. Erie has a harbor for marine traffic formed by a 7 mile long curved peninsula. 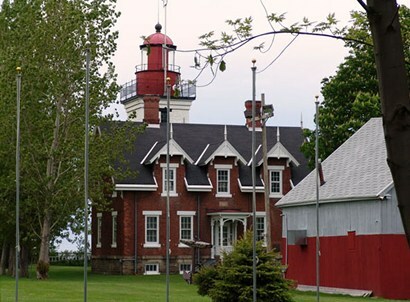 It houses a State Park where the park keeper lives in Presque Isle lighthouse. 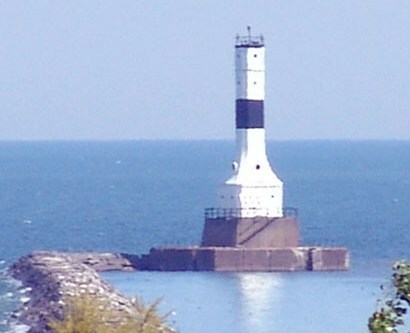 At the end of the peninsula is a pier light named North Point. It marks the peninsula side of the entrance to the harbor. Nearby fishermen were catching bass, rock bass, perch and walleye. There were some floating residences in lake coves similar to those we’ve seen on the Amazon River. Back in the city of Erie we found the third light in Lighthouse Park. 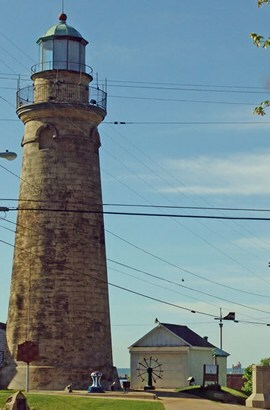 A small lighthouse, nonetheless it marks the landside of the harbor entrance. Crossing this corner of Pennsylvania, it is only 50 miles of lakeshore drive from Ohio to New York State. We located the Dunkirk, New York historical lighthouse, but being after hours we photographed it through a chain link fence. Due to the weather we judged it best to skip Barcelona Lighthouse located near Portland. We stopped in Evans, New York 29 miles SW of Buffalo. Looking to find a lighthouse we went to the Sturgeon Point Marina but the only lighthouse there was a small replica. A squall is happening now, so we avoided Buffalo. This was our last glimpse of Lake Erie. Buffalo is famous for more than “Buffalo Wings.” In 1825 it was the Lake Erie end of a 363-mile long canal from Albany on the Hudson River. The canal forty feet wide by 4 feet deep spurred the first great movement west of the Appalachians. Simultaneously the Erie Canal established New York City as an international center of commerce and finance. About 1850 folks began singing “The Erie Canal” song. This song celebrated the mules that walked along side the canal, dragging barges of freight. Some of us have sung this song all of our lives. Are you one of them?